There's no iPhone app for deposing Gaddafi or swapping out Mubarak, but your everyday tech gadgets and Web services can definitely help. Here's how to use your PC to organize your fellow citizens to rise up (or maybe just come to your Neighborhood Watch meeting). The first thing a revolutionary must do is assess the market for revolution in a given region. Recently a few news organizations have started publishing revolution or uprising ratings or "indexes" that predict the likelihood of an uprising in a given region based on such factors as GDP, duration of current leader's reign, democracy and corruption ratings, and so forth. Check out the Shoe-Thrower's Index (named after Muntadhar al-Zaiydi, the angry Iraqi journalist who threw his shoes at Bush during a Baghdad press conference in 2008) from the Economist and the Uprising Index from Reuters, for example. While these indexes have been only intermittently successful (it's hard to find a formula that predicts unrest in such diverse places as Libya and Jordan, apparently) the number-crunching going on behind them is linking up online data-diving with revolutionaries. 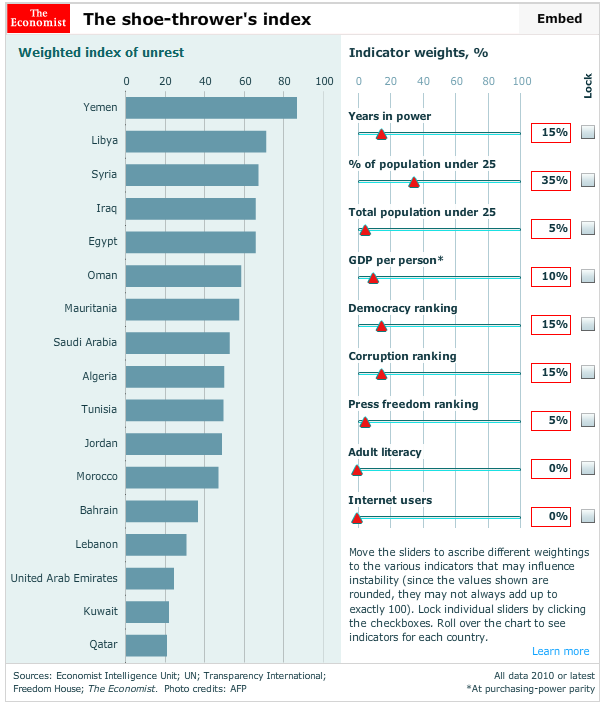 In fact, you can even make your own version of either index: The Economist has a Web app that lets you change the weighting of various factors in the Shoe-Thrower's Index, while Reuters has made its Excel spreadsheet available for the Uprising Index. After you've assessed the political landscape and fine-tuned your messages for optimal agitation, you'll need to identify the best ways to communicate them. Since distributing leaflets in the city square is likely to get you beaten over the head with a truncheon (or worse), it's best to use the broad and immediate reach--and the anonymity--of the Web to plant the seeds of uprising. Facebook and Twitter are common candidates for organizing a popular protest--so much so that the less-discerning reader might think that Egypt's next president will be Mark Zuckerberg and the Fail Whale the symbol of the former Tunisian president. That's because if you have a compelling message, those two services are possibly the easiest ways to mass-distribute that message to your peers, who will then share it with their peers, and so on. Take Facebook, for example. The days where the Facebook Groups were dominated by I Will Go Out Of My Way To Step On That Crunchy-Looking Leaf are over. Instead, Facebook Pages can be used as a nexus for a mass movement--see Google's Head of Marketing in the Middle East, Wael Ghonim, whose contribution to the recent Egypt revolution started with a Facebook Page for Mohamed El-Baradei and another page called We Are All Khaled Saeed. As it turned out, those two pages served as easily-accessible forums for 400,000 people to voice their unrest. Facebook is great for sharing links, photos, videos, and news with your friends, family, and colleagues--whether it's about your new baby or your new political movement. While text-driven discussion pages serve an important purpose, you'll be better able to propagate your message if you have readily-shared photos and video on hand. A carefully-chosen photograph or video of an innocent person being beaten by the ruling party, for example, can quickly boost revolutionary fervor to a fever pitch. Post that video on your Facebook Page, and all people have to do is click the Share button to send it to their own networks. Best of all, Facebook defaults to including the name and link to the original Page or user that shared the link, so anyone who sees your link on their friends' Facebook accounts can easily check out your Page and join the movement. Up-to-the-minute live coverage doesn't work quite so well, however, because the Facebook default view doesn't necessarily show posts in a chronological order. For that, you'll have to use Twitter. Twitter was briefly a media darling for its (likely overstated) role in the 2009 Iran election protests. Where Facebook is excellent for sharing longer messages among your personal and professional social networks, Twitter is better used for sharing links and up-to-the-minute news from whatever tech you happen to have handy. Also, since Twitter isn't necessarily linked to your real name, you can be a bit more anonymous on Twitter than you can on Facebook--which could be crucial, whether you're an organizer or a foot soldier. When it comes to stoking the flames on Twitter, keep in mind that your tweets won't last particularly long--after all, you're limited to 140 characters per message, and even if your messages get retweeted widely, you're unlikely to see a single tweet get passed around for more than a day or so. Keep it short and simple and use a URL shortener like bit.ly whenever you're linking to an image, Web site, or video. Twitter moves much more quickly than Facebook, so you're best served using Twitter for on-going bite-sized tidbits of information, like live-tweeting a protest, passing on quick and timely messages ("Hey guys, the police are about to show up at XYZ intersection"), and providing color commentary for the folks playing along at home. However, for an organization that works towards promoting transparency in government, WikiLeaks itself is rather secretive--and even if you like WikiLeaks' ideals, you might not like its editorial direction. That's why you should keep an eye out for similar sites like Openleaks (currently in alpha, not accepting submissions) and Ruleaks (Russian). You'll need to manage your movement on the go. Remember--keyboard warriors never deposed a dictator from the comfort of a desktop, and your revolutionary cred will suffer if you're not out there getting fire-hosed with everybody else. If you're really doing well, staying more than one night at the same location may get dicey anyway. You'll need to be able to run your tools of revolution from a mobile device. Naturally, your smartphone and social media apps of choice will work fine for updating your Facebook, Twitter, YouTube, and other sharing outlets. However, you can't count on a working wireless Internet connection during times of turmoil--we're seeing more and more governments cut the national cord once things get crazy. (You might want to print out How To Get Internet Access When Your Government Shuts It Down and keep it handy, just in case.) That doesn't mean your cellular network won't work, however. Even if your cellular and landline Internet access gets cut, you can still use voice service and SMS to take care of a few basic tasks. You can start managing your Twitter account via SMS by texting the word START to your appropriate country code (listed here), then sending your user name, and then your password, and then the word "OK" to enable your account for SMS. You can also receive updates from selected users, follow new users, check profile information, and other basic Twitter functions via SMS code--check their SMS Commands page for the complete list. Even if you don't want to use SMS, you might still be able to use your voice to tweet--during the Egypt uprising, Google hacked together a voice-to-Twitter service that used Google's speech recognition tech to post tweets automatically hash-tagged #egypt. Facebook also has a surprising amount of SMS-friendly features, even though items shared on Facebook aren't as bite-sized as the stuff shared on Twitter. You start by activating a phone in the Mobile settings page. Once activated, you can update your status, post messages, and do a few other basic actions. No matter how advanced these online tools get, you need to remember that the real source of a revolution are the people, and those people can get creative with whatever tools are at their disposal. For example, when a series of protests in 2008 almost brought the South Korean government to its knees and forced the resignation of the president's entire cabinet, where were these protests organized? The fan forums of a Korean boy band. Other activists are sending leaflets, DVDs, USB drives, and other information into North Korea--by balloon. In addition, new tools are appearing online that aren't directly intended for revolution but could be a great help for the next Egypt or Libya to appear on the scene. Google recently released a set of tools including a crisis response page and crowd-sourced person and accommodation finders. These tools are intended for use helping victims of the recent Christchurch earthquake, but it's not hard to imagine similar tools being adapted to help unite family members in Libya or to help find shelter for people whose homes are destroyed in the conflict. Have tips or suggestions for fighting the good fight? Leave them in the comments! Patrick Miller's revolution will not be televised. It might be covered on his Twitter or Facebook accounts, though. David Daw refuses to let the man keep him down. Even on his Twitter page.